Niantic, the developers of Pokemon GO, have published an interesting post giving insights on how they create their popular loading screens. The first thing the team does is to decide on the most appropriate Pokemon to feature on the loading screen. Factors include the surrounding events and latest product release. After the Pokemon has been decided, the team gets down to work on a concept sketch, looking at references in various art books, lighting, interesting color schemes, and more. Once the rough sketch is completed and everyone felt comfortable with the general direction, in-game models will be placed to establish scale. The developers will also adjust camera positioning and blocking in color. An appropriate color scheme that is suitable for all smartphones is chosen to make sure the loading screen looks great on every device. 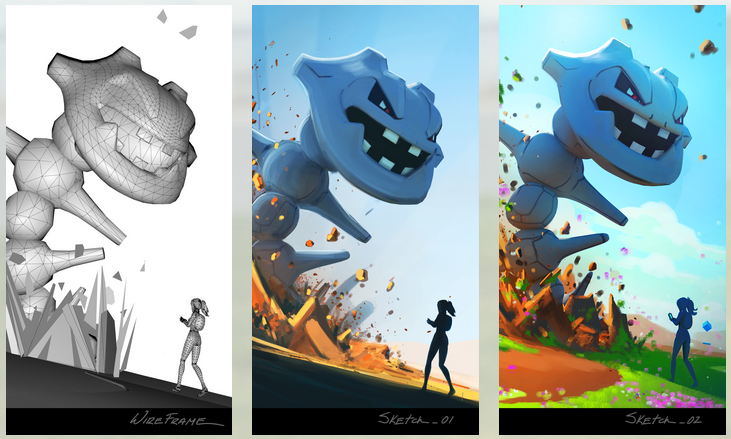 Once the optimum lighting, composition, and mood of the illustration have been decided, Niantic works with brand and design experts to add on any final touches. Before ending off, Niantic has also generously provided high resolution images of all 4 loading screens. You can download them by clicking here.